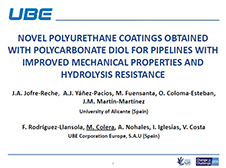 ETERNACOLL® UD100 by UBE is a linear aliphatic unsaturated polycarbonate diol. It is solvent-free and recommended for those UV-curing applications when high performance and durability to the final elastomer is requested in terms of heat, hydrolytic and chemical resistances and weatherability, providing high hardness, scratch resistance and enabling to enhance durability due to higher crosslink effect. ETERNACOLL® UD100 helps provide high- hardness, chemical resistance, thermal stability, mechanical properties, improved scratch resistance and excellent hydrolytic stability to polyurethanes.